Commercial Hardwood floors endure heavier foot traffic and the finish wears quicker and scratches easier than the hardwood floors in a home. 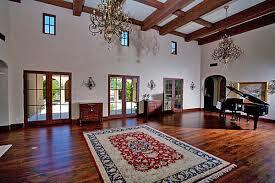 Having your hardwood floors professionally cleaned is important to preserve the longevity and aesthetics of the wood. We deep clean using a rotary brush scrubbing machine and vacuum all of the loose sediment. Then we rinse using a special wood cleaner and extract any additional soil and previous chemicals to restore the pH balance of the floor. We then apply a durable commercial finish that provides a barrier against foot traffic and accidents and will leave a sheen that makes your wood floor protected and looking like new!